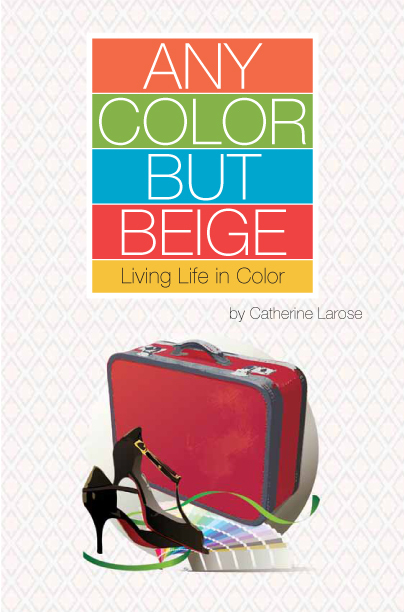 I’d like to welcome author Catherine Larose to Annette’s Paper Trail for a quick stop on her blog tour for her recently launched memoir Any Color But Beige: Living Life in Color. She had me at “beige existence.” Before I even cracked open her book, um…I mean downloaded it to my Kindle app, I knew Cat’s story would resonate with me. I was always the girl who lived out loud in technicolor, but as I’ve gotten older, time has sandblasted me to a mute sepia. Cat’s well-developed themes of dissatisfaction and desire for change are a universal wake-up call for women who need to bring new color into their lives, or get back the shades of a vibrant life they’ve somehow lost along the way. Any Color But Beige takes you on Cat’s personal journey from her decision to leave a beige marriage through her evolution of finding the pulse of color in her life. The backdrop for her soul-searching and dating adventures spans the globe as Cat’s stories of love and loss vividly transport you into scenes that bring the places and cultures (and men) of South Africa, France, and Northern Italy to life. Any Color But Beige reads like a sophisticated chick-lit novel, light in tone yet intellectually satisfying. With every turn of the page, you live vicariously through Cat’s travels and travails as she searches for love and finds herself. Her engaging memoir is a great inspiration to live your life in color. As an author, I’m not sure there is anything that compares to the feeling you have when you launch your first book. Cat had a fabulous book launch party in Montreal, and in the video, she takes you on a quick trip through that gorgeous cosmopolitan city to attend her special night. Take a peek; it will inspire you to live in color and pursue your writing dreams. I decided to ask Cat a few questions about her thoughts on memoir writing and color, so grab a cup of tea and join us. And don’t forget to leave a comment for your chance to win a copy of Any Color But Beige: Living Life in Color. Personally, I love memoirs—real people making real decisions in real life situations. I think it’s so much more personal for the author and relatable for the reader. Many writers consider memoir, but are hesitant to put their personal stories “out there.” What made you do it? I think it depends on the story you have to tell. Some memoirs can be quite dark and heavy and that brings with it a whole host of complications involving not only the writer but also other people. My story centered on my journey, and I think there’s certain lightness to it. Everyone in the memoir advanced my self-knowledge even if their behaviors weren’t always exemplary. Even then, I took precautions by changing details to avoid any unnecessary complications or hard feelings. What words of wisdom or suggestions do you have for the would-be memoir writers who are teetering on the memoir/fiction fence and afraid to take the leap? If you’re going to worry about writing a memoir, if it’s going to keep you awake at night, then write fiction. It’s not worth losing sleep over. A good story is still a good story. And it’s still your story. My thoughts exactly! A memoir is the author’s journey and it’s her personal story to tell, but I always wonder how the other “characters” feel about their starring roles. In your memoir, there are a variety of relationships (marriage, transition guy, no strings attached, et al.) that you explore in your evolution of personal color. Do any of the guys know they’re in the book? If so, how have they reacted? I’m taking a little detour here, but I have to mention that I find color theory fascinating. What insights can you share about how/what color influences creativity? There have been many books written about color psychology and the effect of colors on all aspects of our life. I think you have to consider your own personal preferences and creative tasks at hand. Vibrant colors stimulate the brain and pastels have a calming effect. So, in my sewing room I have pastel colors on the wall while the fabrics I work with are bright and colorful. In my office, I hang purple-colored glass crystals in my window to stimulate the creative process. Purple has been associated with mystery and magic and is perfect for the creative process, which remains a mystery to everyone. So, what’s next for Cat Larose? Another book? More globe-trotting adventures? I am working on a turning the book into a screenplay — just for fun. And a second book as well. My next adventure…I’d really like to hop a freighter and visit some exotic ports of call. I think that would give me lots to write about! If your life was a color — what color would it be? And why? 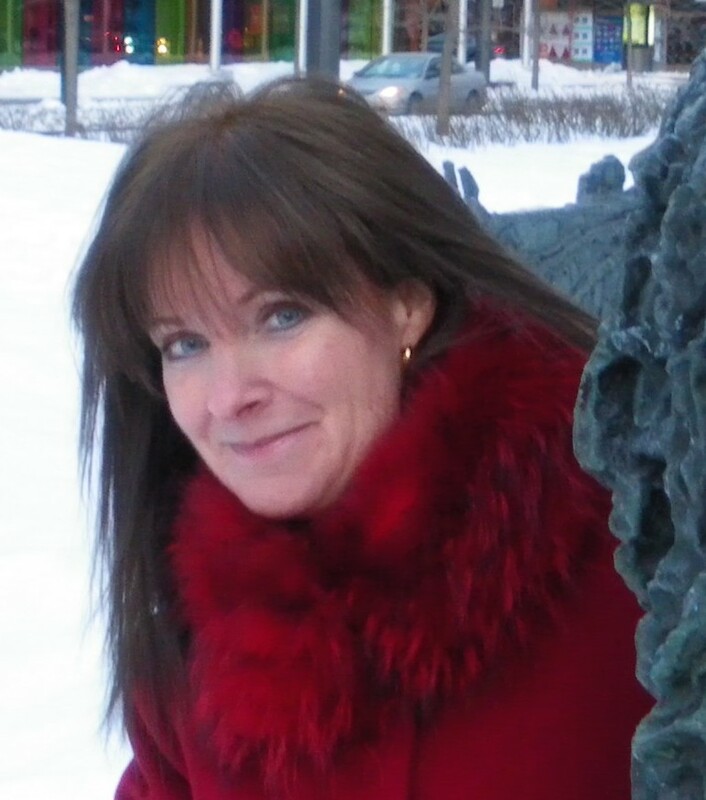 Catherine “Cat” Larose is an international color-marketing expert who travels the world selling color. A graduate of Ohio University’s Scripps School of Journalism, Larose previously worked in advertising, public relations and journalism. She is the voice behind the successful Café Girl Chronicles blog (http://cafegirlchronicles.wordpress.com/) and currently writing her second book. Ok, I want to play the color game too. =) If my life were a color…it would be bright yellow, like a sunny day at the beach or a bouquet of tulips. For me, it’s the color of happiness and hope. Even when times are tough, I try to keep my thoughts yellow. I spent years being afraid of color…I was pretty much a black and blue kind of gal…in more ways than one, but that’s another story. When I finally found my voice, I found I loved color! I were lots of purple with red and orange with red and green and yellow. Wonderful thing is, when I wear color, I feel better and everyone around me feels the same way. It is a win/win situation. The book sounds fascinating! Blessings to all. This book sounds like just what I need. I’ve been feeling a little colorless—all work and no play. Time for some purple and orange! Or specifically, I might do a little stand-up comedy. I love the purple / orange combination – they’re complimentary. Wear them on stage! If life was a color it’d be red, always on the go, always moving and on high alert. Wow. This is a story that resonates with those who took charge of their destiny. I’m excited to read it. Thanks for sharing this Annette and Cat. If my life were a color..I’m picking white because I’ve been walking toward the white light which really symbolizes the life I’m supposed to be living. I’m finally basking in the light and in the life I had been avoiding and afraid to chase down and have. I’m here now, better late than never. Better late than never is right! I hope the light is so bright you have to wear shades. Good on you! Writing in Books: Valuable Marginalia or Graffiti? Take Stock of 2010: Did You Reach Your Goals? Anti-Procrastination Project – Do It Now!